The Angling Times Supercup is the biggest club team event in the U.K match fishing diary, the 2015 event attracted over 300 teams! Over the last 5 years I have fished the competition for Warrington A.A and have been lucky enough to reach the final and also the semi-finals on a couple of occasions, in fact, being part of a team and going on a good cup run brings with it a massive amount of satisfaction. Not only do you have your own sense of triumph but you also feel that of those around you. This year I have decided to enter my own team, mainly because I see it as an opportunity for the club that I have fished with for almost a decade (Stockton Heath Angling Group – or S.H.A.G as it’s known locally) to get involved in a competition which will not only be good for the individuals involved in terms of developing their angling against other teams and visiting various new venues but also to consolidate the squad by working together as a team rather than what most are used to which is fishing as an individual and keeping their cards close to their chest. I submitted my team into the Angling Times in early January and ensured I didn’t end up poaching lads who Warrington would want for their team. The event is a team of 6 event but a squad of between 10 & 20 was what the Angling Times had asked for, with the events qualifiers being held in spring and the latter rounds being in the summer having a large squad will be beneficial when holidays or other events start clashing with the Supercup matches. February 16th was the release date of the first round draw and where we would find out who we would face in the first round and vitally whether we would be the home or away team and therefore whether we would get the choice of the venue or whether we would have to go to our oppositions venue of choice. I picked a copy of the Angling Times up that morning on my way to work and flicked straight to the page with the draw printed on it, Trafford Bait and Tackle! Definitely one of the better teams in the event having reached the final quite a few times over the last few years. To make it worse we had been drawn away, typical. Within a couple of days of the draw I got a phone call off Phil the Trafford captain who informed me they would be taken us on a Venue called Goose Green Fishery near Alderley Edge.. I had expected them to take us on Partridge as they had done my Warrington team just three years previous (where we knocked them out of the competition). I’d never actually heard of the venue myself so a call around for some information and I soon had a bit of an idea about the venue. Having got a good response to a practice session I had arranged I decided I would book the whole lake and fish it as a casual match/knock up between the 14 attendees. Not everybody in attendance was at my disposal come the day of the match. There was a mixture of the named squad, some of the Warrington team (which didn’t end up putting a team in!) and also a couple of extra’s including Dave Brooks who was there to help us try and work the venue out and put a plan together. The match lake at Goose Green is oval in shape with a small island at one end of the lake, there are no permanent pegs on the lake but would approximately house around 20 anglers. One side of the lake is standard sort of depths being relatively shallow on the short pole line and up to around 6/7 foot at 13 / 14 metres. On the opposite bank there is a deep channel running the length of the pool between an inlet and an outlet at either side of the lake. Here we found up to 14 feet of water, finding it got gradually deeper the further up the lake you were. I ran the day as I would a standard match and conducted the draw at 9:00am, rather than placing anglers in specific areas, the majority of the pegs in the bag were either out of the wind protected by the high bank at one end of the lake or anglers would have the wind off their backs, what you’d want if having to deal with wind. 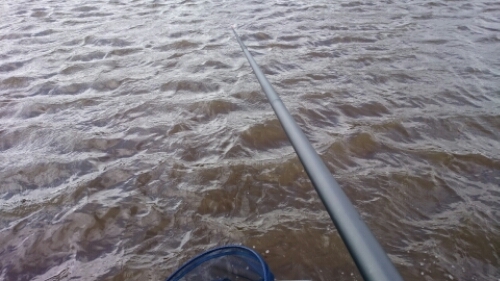 From the draw it ended up I was at the top end of the lake on one of the deep pegs with the wind smack bang in my face, not ideal with the forecast for the day being strong winds and potential thunderstorms! I’ve never been a fan of sitting on a flier in a practice anyway… (I told myself as a made my way to my peg for the day knowing it was going to be a grueller). The whole point of the days session was to work out what would work and what wouldn’t come the day of the match, I had therefore asked the majority of the people who were fishing what tactics they would be using and shaped my own day around this to do something a little different. I’ve fished a pretty simple match focusing on 3 lines, a short pole line, a long pole line and a feeder line. For obvious reasons I’m not going to go into every detail about how I’ve fished the day but it’s safe to say there are plenty of fish to be had at the venue. 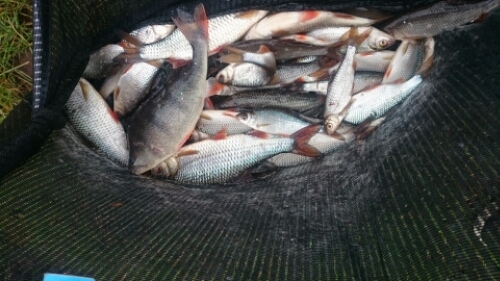 Everyone involved has caught plenty of fish with some having a few bonus fish mixed in. I have struggled for a lot of the match due to the wind, my long pole line was all but redundant and presentation of my rig and therefore bait was made extremely difficult due to the strong winds in my face which meant the waves on the lake were dragging my float under the tip of my pole. The last couple of hours of the session was where I managed the bulk of my weight catching consistently with the majority of my fish being Roach up to 8oz. Had the conditions been right I would fancy the venue to do some really good weight of silvers alone and with the potential of a few carp and/or Bream mixed in it could make for an interesting match on the day of the main match. With an hour of the match remaining, the weather that had threatened all day finally got the better of us and following a few flashes of lightning within a close proximity the heavens opened to what can only be described as golf ball sized hale stone.. Which were hitting the people on the same bank as myself flush in the face due to the strong winds and at that point we called it a day..
Dave Brooks won the knock up on the day catching some nice Roach and Skimmers, nearly doubling the weight of second place and commented on the days fishing as being similar to a day in Ireland… I think he was referring to the rediculous winds rather than the prolific Bream fishing!! Other notable performances included Derek Smith, Wayne Chriscoli and Stuart James who also caught a few bonus fish and did well in the overall results.